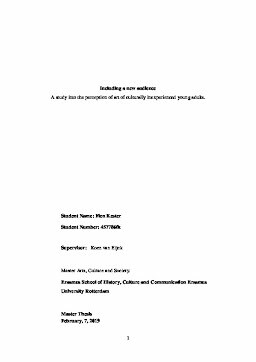 Erasmus University Thesis Repository: Including a new audience - A study into the perception of art of culturally inexperienced young adults. Including a new audience - A study into the perception of art of culturally inexperienced young adults. The target audience of museums traditionally consist of people from the higher social classes. Contended by the influential reproduction theory of Bourdieu (1984), the higher social classes transmitted cultural knowledge, -taste and –manners onto their children while the lower classes were assumed to experience difficulties in understanding high arts. Over time, the distinction between high and low culture and associating audience has been replaced by the idea that the higher educated are more open to a combination of highbrow and popular forms of art (Peterson & Simkus, 1992). However, theory on taste segmentation mainly focusses on the cultural active highbrows and omnivores, while data on the lowbrows or univores is still limited. This is striking because cultural participation by all layers of society is a commitment that many European countries emphasize in their policy concerns (Stevenson, Balling & Kann-Rasmussen, 2017). Museum Boijmans Van Beuningen is one of the museums that aims at attracting an audience from “a wide cross section of the public”. In order to attract this new audience it is important to understand and interpret their perception and appreciation of different forms of art. Therefore, this study scrutinizes the question: How do non-visitors perceive, appreciate and experience museums and how do their perception and appreciation change as a result of attending a museum? By means of observation of museum visits, before- and after measurements and in depth interviews the role of art and reactions to museum exhibitions are studied. The young adult (18 – 21 year old) respondents are selected among MBO fashion students – a field at the interface of arts and culture and have multiple ethnic backgrounds. Results of this study are discussed in groups, which are compiled based on cultural socialization levels and current cultural activity. Predominantly, it was shown that respondents demonstrate an ego-world relation that is anchored in their ego. As a result, recognisability within an artwork or exhibition and an association that they are able to make with themselves, help to overcome feelings of disinterest and indifference. Allowing themselves to relate to a work of art in their own manner rather than conforming to art historical conventions, enables the respondents to establish an individual relationship with an artwork. Consequently, a preference for action and stimulation of the senses is found. But, the respondents did also prefer to find out about the meaning of an artwork. To overcome limited artistic vocabulary and knowledge, the respondents need suitable guidance through the exhibition. It became clear that they seek for escape, relaxation and to discover new things in a museum. Discouraging factor appears to be the absence of cultural active peers or family, but the absence of cultural socialization does not inevitably lead to a reluctant attitude towards museums. All were able to selectively appropriate elements of both museums and associate them to their own lives, resulting in interest and enjoyment and intentions for revisiting.